William Kristol, Fox News überpundit and Weekly Standard editor managed to get an Op-Ed in Sunday’s Washington Post. His point, if you have not already guessed, is to point out just how wonderful a president Bush will considered – in retrospect of course. Why yes, Mr. Kristol, you will; here’s mine. Kristol starts by looking at the wonderful things that have happened in the years of the Bush presidency. Things like no more terrorist attacks on US soil, a strong economy and * cough * an obviously winning strategy in Iraq. Let’s take these in order, shall we? First, the no more terror attacks on US soil. True. The sky also didn’t turn green and the Germans haven’t elected a new Hitler and the 60% of Americans becoming increasingly frustrated with the federal government still haven’t left the country either. Funny that Kristol doesn’t assume these to be accolades of the current administration. Perhaps we only have to give him time. But what about those pesky little terror attacks. Madrid, London, – London again (sort of), Glasgow (sort of). Kristol is right that the US has largely avoided al Quaeda terror attacks in recent years. Of course the same could have been said of Bill Clinton in 1999. But hey, why go there? There was the largely forgotten and never explained Anthrax attacks that took place – um –after 9/11? Then there was that pesky little hurricane thingy that destroyed New Orleans and reshaped the Gulf Coast. Not terror but the federal response, lead and coordinated by Bush, was terrifyingly bad. We could look at last week’s report by the GAO that a fake firm, basically a mailbox and a telephone number, would have been able to purchase the materials for a dirty bomb. No not an attack, but terrifying. Perhaps the only reason al Quaeda doesn’t attack is because there isn’t any reason. America is doing a just fine self destructing all by itself, thank you. Perhaps that is why Chertoff has a stomach problem. Maybe he was simply eating salmonella infested spinach picked by “undocumented workers” his department seems unable to keep out of the country. Which brings me to the economy. What does Mr. Kristol have to say? After the bursting of the dot-com bubble, followed by the attacks of Sept. 11, 2001, we’ve had more than five years of steady growth, low unemployment and a stock market recovery. Did this just happen? No. Bush pushed through the tax cuts of 2001 and especially 2003 by arguing that they would produce growth. His opponents predicted dire consequences. But the president was overwhelmingly right. Even the budget deficit, the most universally criticized consequence of the tax cuts, is coming down and is lower than it was when the 2003 supply-side tax cuts were passed. Bush has also (on the whole) resisted domestic protectionist pressures (remember the Democratic presidential candidates in 2004 complaining about outsourcing? ), thereby helping sustain global economic growth. What do those pesky facts show? Well, I’ll just ask the U.S. Census Bureau. 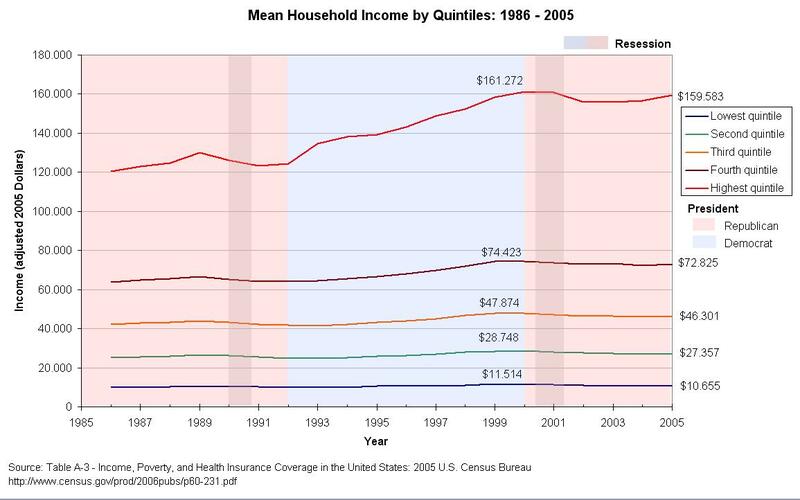 Since the yearly reports come out in August, (perhaps the reason for Mr. Kristol writing this Op-Ed now) I have to reach back to the Income, Poverty, and Health Insurance Coverage in the United States: 2005 released in August 2006. Then there is the minor fact that gasoline prices have now almost doubled since George W. Bush took office. Kristol then comments that even progressives would have to admit that Roberts and Alito are impressive supreme court judges. I’d say no problem Mr. Kristol. I’m sure you would agree that Ahmadinejad and Hugo Chaves are impressive international statesmen. Impressive is such a malleable word, isn’t it? As to making the claim that Roberts and Alito are conservative constitutionalists, I guess I would say that you might think so. Of course, if you assume the constitution is based on enlightenment principles and not on the ten commandments, it could have been worse. Kristol then moves from domestic fantasies into international ones. He starts off pointing out that “the war in Afghanistan has gone reasonably well”. I won’t even go there except to reference the attack of the 10 foot tall marijuana plants. Something Mr. Kristol is certainly glad to see based on what he must have been smoking while writing this piece. He then proceeds to wave his hand at any Pakistani problems and assumes that “Bush will deal with them.” Oh. Great. As for foreign policy in general, it has mostly been the usual mixed bag. We’ve deepened our friendships with Japan and India; we’ve had better outcomes than expected in the two largest Latin American countries, Mexico and Brazil; and we’ve gotten friendlier governments than expected in France and Germany. China is stable. There has been slippage in Russia. The situation with North Korea is bad but containable. Hmm. The recent Pew report might present reality a bit differently. Let’s see. In the current poll, majorities in 25 of the 47 countries surveyed express positive views of the U.S. Since 2002, however, the image of the United States has declined in most parts of the world. Favorable ratings of America are lower in 26 of 33 countries for which trends are available. The U.S. image remains abysmal in most Muslim countries in the Middle East and Asia, and continues to decline among the publics of many of America’s oldest allies. Favorable views of the U.S. are in single digits in Turkey (9%) and have declined to 15% in Pakistan. Currently, just 30% of Germans have a positive view of the U.S. – down from 42% as recently as two years ago – and favorable ratings inch ever lower in Great Britain and Canada. I’m actually surprised Mr Kristol didn’t make more of Americas improving relationship with “Christian” Africa. And then Kristol get’s to the heart of the matter. That teeny-weeny, eensy-bitsy, tiny detail he’d been avoiding the whole Op-Ed: Iraq. Here Kristol starts harkens back to the days of Ulysses S. Grant and pushes Petraeus into the forefront. Bush is no longer Commander in Chief but the guy who picked the guy who’s going to win in Iraq. Or maybe not. I’m starting to think that Patraeus will be named Patsy by September and it seems I am not alone. Sorry Mr. Kristol, no happiness there. Oh. But then again maybe facts don’t bother Mr Kristol. You might notice something about my post. I have links to where I got the information to refute Mr Kristol’s “facts.” His Op-Ed is largely – no – completely link free; just like his reality. There is no reason to back up statements with facts. Facts are just so yesterday. One can only look forward to the days when the Washington Post finally decides to stop publishing this balderdash. In the meantime. If Mr. Kristol’s last comments are any indication of his betting ability, I’d love to get in a game of poker with him. His crystal ball seems a bit smudged. What it comes down to is this: If Petraeus succeeds in Iraq, and a Republican wins in 2008, Bush will be viewed as a successful president. In what seems to me to be a strangely underreported story, US – Turkish tensions on the northern Iraqi border are rapidly breaking down. Speigel-Online is reporting that the situation seems to be escalating. The signs have become increasingly ominous. For weeks, Turkey has been building up its military presence on its south-eastern border with Iraq in response to cross-border raids by Kurdish rebels. Potentially more concerning, Ankara has been openly considering an incursion into Kurdish-dominated northern Iraq in an attempt to root out members of the Kurdistan Workers Party (PKK) based there. On Sunday, US Secretary of Defense Robert Gates saw the situation as sufficiently heated to issue a warning to Ankara. “We hope there would not be a unilateral military action across the border into Iraq,” Gates told reporters on Sunday. But Ankara is unlikely to be placated by US sympathy. Indeed, the Turkish military shelled Kurdish positions on the Iraqi side of the border on both Sunday and Monday, according to the Belgium-based Firat news agency. Furthermore, the Dogan news agency reported that a suicide bombing had killed three soldiers at a military outpost in south-eastern Turkey on Monday. At the same time, all my normal news channels (and most of my morning reading) was taken up by the Rice attempt to disarm or at least de-tooth (de-pacemaker?) Cheney with respect to Iran. I wonder why this story is getting so little play in American and English media? Perhaps because neither the Democrats nor the Republicans want an escalation on that front giving no reason for beltway journalists to cover it? Look at the motivations of the various factions. Perhaps that’s why there is so little reporting on the issue. As far as I can tell, for US politicians, it’s a lose-lose situation best kept under wraps. I just wonder if anyone can convince the Turkish politicians of the same thing? A new documentary about prisoner abuse premiered at the New York Film Tribeca Film Festival. It’s narrative centers around the death of a Taxi driver who simply took a wrong turn. A wrong turn that cost him his freedom and eventually his life at the hands of American jailers. Longtime readers of this blog know all too well many of the details – but this film does what a parasitic blog cannot, and what even all the innovative reporting on the subject has not yet been able to do. It puts it all together. It represents a moment in this war when we can actually stop and look back from rising ground, and see how far we have come from the civilized norms of warfare that the United States represented in the last century. I have to be honest, it’s not the easiest thing to sit through. The film, which primarily focuses on abuses at Bagram, Abu Ghraib and Guantanamo, contains footage of the Bagram base that’s never been seen anywhere else, as well as the shockingly familiar images from Abu Ghraib, uncensored and high res. The filmmaker, who attended last night’s screening at Yale, described it beforehand as a sort of murder mystery, using as its springboard the story of Dilawar, the young taxi driver who was apprehended by Afghan militia and turned over to the U.S. military at Bagram, where he was, in fact, eventually murdered. And that’s not hyperbole — the official coroner’s report lists the cause of death as “homicide.” (The film notes that out of more than 100 deaths in U.S. custody, 37 have been officially declared homicides by the U.S. military itself. Perhaps even more shocking is the fact that only seven percent of Guantanamo detainees were actually apprehend by the U.S. military — the rest have been turned over by Afghan warlords, Pakistanis, bounty hunters, etc., any of whom may have had agendas having nothing to do with the American war on terror. Dilawar’s captor, for instance, turns out have been the person actually responsible for the rocket attacks of which the taxi driver was wrongly accused). Speigel Online (German) holds out the hope that Taxi to the Darkside, produced and directed by Oscar nominated Alex Gibney, might bring some light into the shadows thrown by the torture scandals created by the Bush presidency. That the documentary might bring new life into the discussion of American use of torture in a world after everything changed. I hold no such hope. The story of Mr. Dilawar’s brutal death at the Bagram Collection Point – and that of another detainee, Habibullah, who died there six days earlier in December 2002 – emerge from a nearly 2,000-page confidential file of the Army’s criminal investigation into the case, a copy of which was obtained by The New York Times. This story ran over two years ago. It made a brief blip on the radar of American consciousness only to disappear like Dilawar did. Largely forgotten. Unremembered like a bad dream. This movie will do little to change how an America thinks; an America that (rightly) mourns 32 fallen University students but ignores the 120 Iraqis who die the same day. An America that doesn’t mourn the Iraqi deaths passing through the headlines and scrolling subtitles day after day after day; mourn the Afghan deaths that don’t even make it that far. There is little chance that policies supported by people like Alberto Gonzales, someone who plays a role in the documentary, are will be condemned unless it effects Americans; Americans like US attorneys, who are, I might add, still among the living. Then it becomes scandal. And Taxi to the Dark Side? Go ahead, watch the preview for yourself. It will be a shame that this documentary will be seen as just one more attempt by a liberal media to ‘influence’ the public. It will attract those who already know there is a problem with America. Those interested in upholding American principles, American honor; American honesty. It will be ignored by the very people who need – no – must see it and must be shown the path down which America has been taken. It looks to be a powerful film. I urge you to at least blog the title, at least link to a review. At least get the ‘Google Factor’ up. Even if the film isn’t widely spread, it’s message needs to get out. You kept claiming the American invasions in Iraq and Afghanistan were the start of a new Christian crusade? You were right. Today, many churches and religious groups host revival services at the changing of the seasons – spring and fall. “I enjoyed the services and the message was comforting, especially being away from home under these circumstances,” said Sgt. 1st Class Terrance Williams, 82nd Combat Aviation Brigade. * sigh * And “Islamo-fascists” are the bad guys trying to bring their religion to America?